Did a meteor over central Italy in AD 312 change the course of Roman and Christian history? A team of geologists believes it has found the incoming space rock's impact crater, and dating suggests its formation coincided with the celestial vision said to have converted a future Roman emperor to Christianity. It was just before a decisive battle for control of Rome and the empire that Constantine saw a blazing light cross the sky and attributed his subsequent victory to divine help from a Christian God. Constantine went on to consolidate his grip on power and ordered that persecution of Christians cease and their religion receive official status. In the fourth century AD, the fragmented Roman Empire was being further torn apart by civil war. Constantine and Maxentius were bitterly fighting to be the sole emperor. Constantine was the son of the western emperor Constantius Chlorus. When he died in 306, his father's troops proclaimed Constantine emperor. But in Rome, the favourite was Maxentius, son of Constantius' predecessor, Maximian. With both men claiming the title, a conference was called in AD 308 that resulted in Maxentius being named as senior emperor along with Galerius, his father-in-law. Constantine was to be a Caesar, or junior emperor. The situation was not a stable one, however, and by 312 the two men were at war. Constantine overran Italy and faced Maxentius at the Milvian Bridge over the Tiber a few kilometres from Rome. Both knew it would be a decisive battle with Constantine's forces outnumbered. It was then that something strange happened. Eusebius - one of the Christian Church's early historians - relates the event in his Conversion of Constantine. "...while he was thus praying with fervent entreaty, a most marvellous sign appeared to him from heaven, the account of which it might have been hard to believe had it been related by any other person. "...about noon, when the day was already beginning to decline, he saw with his own eyes the trophy of a cross of light in the heavens, above the Sun, and bearing the inscription 'conquer by this'. "At this sight he himself was struck with amazement, and his whole army also, which followed him on this expedition, and witnessed the miracle." Spurred on by divine intervention, Constantine's army won the day and he gave homage to the God of the Christians whom he believed had helped him. This was a time when Christianity was struggling. Support from the most powerful man in the empire allowed the emerging religious movement to flourish. But what was the celestial event that converted Constantine and altered the course of history? Jens Ormo, a Swedish geologist, and colleagues working in Italy believe Constantine witnessed a meteoroid impact. The research team believes it has identified what remains of the impactor's crater. 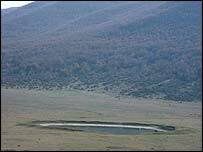 It is the small, circular Cratere del Sirente in central Italy. It is clearly an impact crater, Ormo says, because its shape fits and it is also surrounded by numerous smaller, secondary craters, gouged out by ejected debris, as expected from impact models. It would have been quite an impressive sight and, if it really was what Constantine saw, could have turned the tide of the conflict. But what would have happened if this chance event - perhaps as rare as once every few thousand years - had not occurred in Italy at that time? Maxentius might have won the battle. Roman history would have been different and the struggling Christians might not have received state patronage. The history of Christianity and the establishment of the popes in Rome might have been very different.